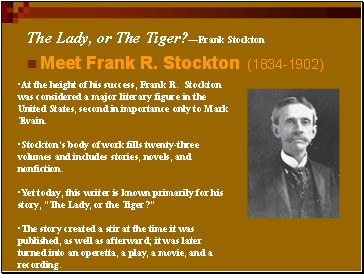 At the height of his success, Frank R. Stockton was considered a major literary figure in the United States, second in importance only to Mark Twain. Stockton’s body of work fills twenty-three volumes and includes stories, novels, and nonfiction. The story created a stir at the time it was published, as well as afterward; it was later turned into an operetta, a play, a movie, and a recording. 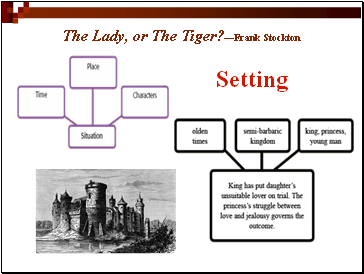 Exposition During a plot’s exposition, the author gives background information about the story and introduces the story’s characters and setting. The exposition also introduces the main conflict. 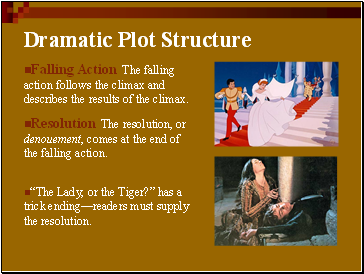 Rising Action Rising action is the series of events that lead up to the climax, or most dramatic moment, of the story. 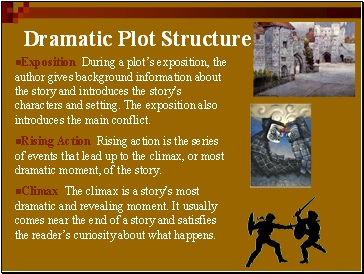 Climax The climax is a story’s most dramatic and revealing moment. It usually comes near the end of a story and satisfies the reader’s curiosity about what happens. Falling Action The falling action follows the climax and describes the results of the climax. Resolution The resolution, or denouement, comes at the end of the falling action. 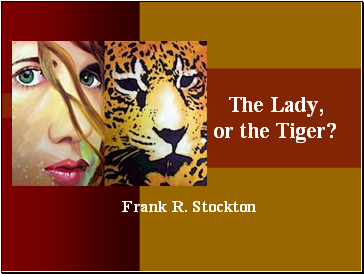 “The Lady, or the Tiger?” has a trick ending—readers must supply the resolution. 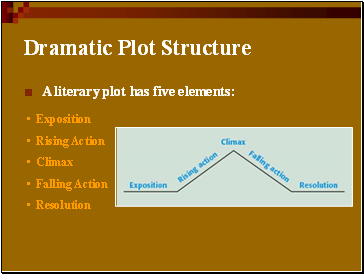 Most plots develop around a conflict, or struggle between two or more forces in a story. 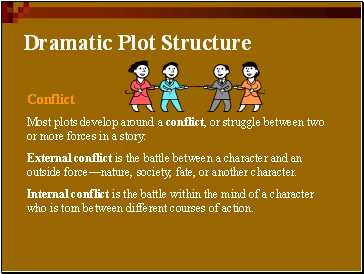 External conflict is the battle between a character and an outside force—nature, society, fate, or another character. Internal conflict is the battle within the mind of a character who is torn between different courses of action. Would you trust your life to a friend? 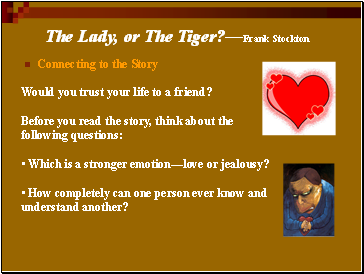 • Which is a stronger emotion—love or jealousy?